Give your child a personalized letter from their Elf on the Shelf with this free printable. You can customize this candy bar wrapper with your child's information and give as a sweet gift this Christmas. You and you're elf with be the hit of the day! So Christmas is only a few weeks away and you and you're Elf on the Shelf have been working hard to make sure your kids have been good and are staying off Santa's naughty list this year. Reward them for all that good behavior with a personalized letter direct from the North Pole and your Elf on the Shelf. As a subscriber to our email updates newsletter, you will receive all the updates from DIY Party Mom newest posts and a free exclusive printable each month. If you're not a member, be sure you go NOW to subscribe and get this free Elf on the Shelf personalized letter printable. Once you have signed up, you will receive the link to download this PDF file so you can make your own sweet letter to your child. Once you have received the email, open your file in Adobe Acrobat and scroll down to the back of the Candy bar letter. 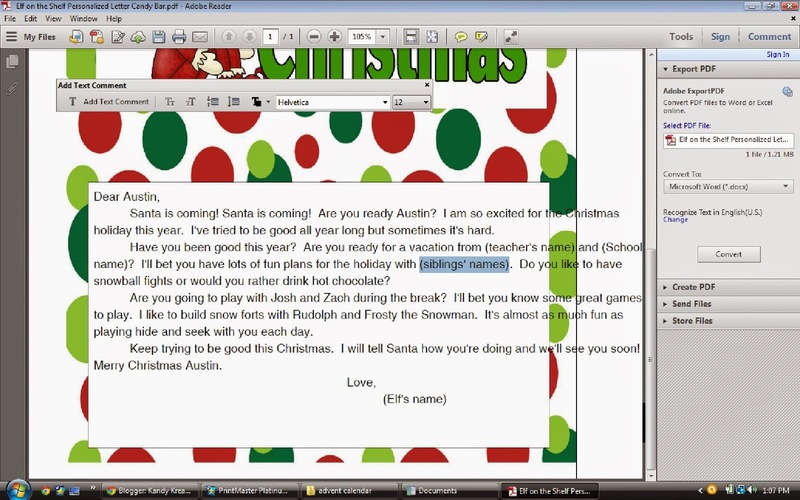 You will see the letter from your Elf with parts of the text in parenthesis. Double click on the areas and you should be able to replace (child's name) and other areas with personalization for your child. You can add the child's name, school name, teacher's name, friend's names, siblings names, and your Elf on the Shelf's name. When you click on the box, it might mess up the formatting on the letter, so when you're done, click outside the box and use the arrows that come up around the text box to drag it back inside the white area. Now go ahead and click print. You will want to keep the print as is, and not resize to fit or anything like that. 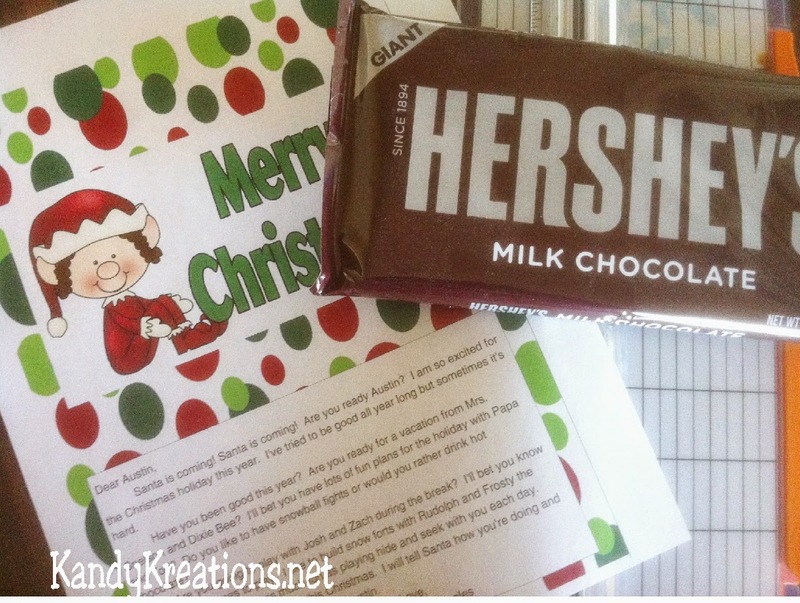 Grab a 7 ounce Hershey candy bar from your secret chocolate stash, your favorite paper cutter, and your Elf on the Shelf personalized letter printable. Cut out the printable and wrap it around the candy bar with the elf design on the front of the bar covering the "Hershey" logo. Wrap the letter around to the back and place a little bit of glue or tape on the inside of the letter under the flap with your Elf on the Shelf's name..
Now let your Elf give his letter to your child when they wake up in the morning after a particularly good day and enjoy the fun of a personalized letter and the sweetness of a yummy candy bar. Don't want to sign up but still want this letter? Or do you want other personalized letters to send to your child at Christmas? 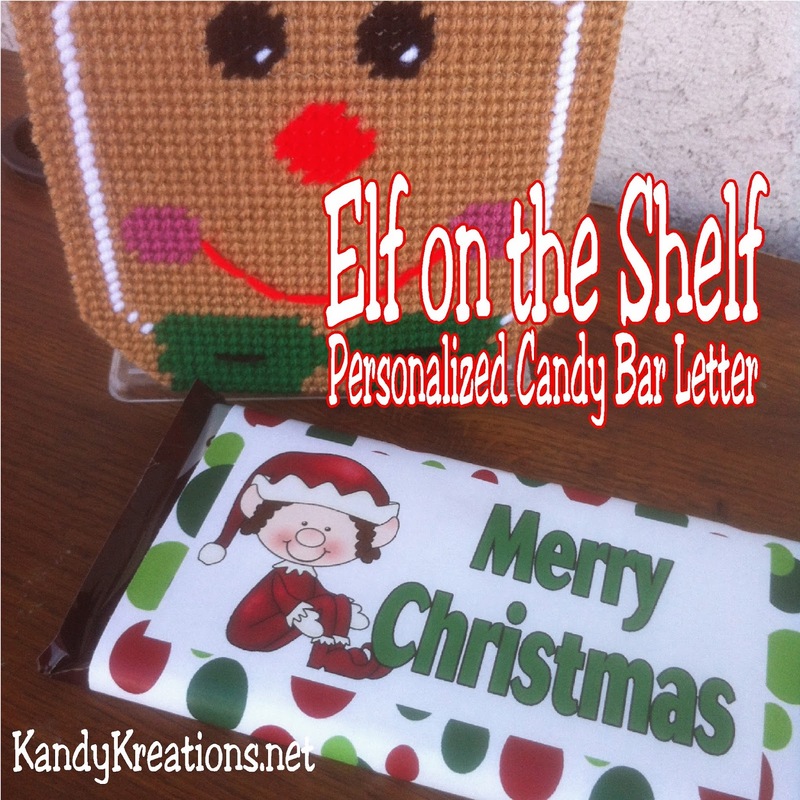 Check out all of our Christmas personalized candy bar letter downloads here.